The jewel in Turkey’s coastal crown attracts visitors by land, sea... and air. Sarah Probert dips a toe in the water. It is possibly one of the most photographed beaches in the Mediterranean. 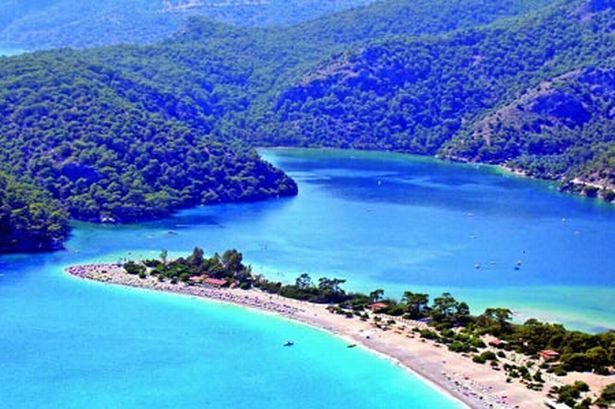 The famous blue lagoon at Olu Deniz on the south coast of Turkey has become a prime spot for travellers who seek tranquil waters and a place to relax in the unspoilt surroundings of this area of outstanding natural beauty. Here paragliders blissfully float over from the surrounding mountains and turtles can occasionally be seen popping their heads out of the warm turquoise waters for an intake of breath. We arrived at this little oasis for a family wedding, the blue lagoon location an obvious attraction for many couples wishing to tie the knot in serene surroundings. Its famous setting has made it one of the best paragliding spots in Europe and admiring its natural beauty, it is easy to see why. Our hotel was on the lagoon itself and because we were in a protected environment, the complex did not overshadow its natural setting, with rooms discreetly nestled into the mountains. Hotel Meri is a superb spot for those wanting a relaxing beach holiday. You only have to take a few steps down from the main restaurant to reach the sandy shores. In the evening it is great to be able to eat dinner, sip wine and watch the sun go down over its tranquil waters. The place is perfect for young children who can swim in the warm shallows with no fear of being pulled away by any waves or strong tides and as the beach is relatively slim – you only have to take a few footsteps from the sun lounger before you are in the water. We were grateful that the hotel had its own private section of the beach, meaning it was fairly quiet when we visited in May, so there was no fight for sun loungers by the shore. The lagoon is a draw for other tourists, so further up the beach beyond the private strip offered by Hotel Meri, there are other bars and restaurants running sections of sun loungers for a price of a few lira a day. We visited a few of them to meet friends, although the loud dance music constantly blaring out at one of them did not make for a relaxing afternoon. Many holidaymakers from Olu Deniz flock to these sections, as the main resort only has a pebbled beach, which isn’t ideal for children, so mini bus loads tend to turn up early, which could mean more of a fight for a sun lounger during peak season. Hotel Meri’s rooms are fairly basic but clean, what you would expect for a three-star hotel, with some having views of the lagoon itself. Due to the location, there are a lot of steps to climb to get to and from the rooms and the beach, so if you have young children or are infirm, this could be an issue if you end up in the rooms near the top of the complex. There is a rather old mechanical lift which can take people up the hill, but this doesn’t work in wet weather – which, surprisingly, we did have some of – hence why the mountains are so green. All rooms have balconies and we needed to throw the door to our balcony open to let enough light into the room as they are a little dark inside. The hotel operates on an all-inclusive basic, so all food and drinks are included. The food was a little disappointing, there wasn’t much variety and it appeared the hotel was catering very much for the needs of its majority of guests, who were German. However, the fact that you could help yourself to cool drinks all day and take them down to the beach is very handy. The freshly baked bread for all meals was delicious and there were plenty of traditional Turkish desserts on offer. If you do get bored of the food the nearby resort of Olu Deniz, a 10-minute walk away, has some decent restaurants on the sea front offering freshly caught fish and Turkish meze at reasonable prices. But whilst the food lets Hotel Meri down a little, it is its prime location which is the real draw for guests. For those who don’t want to just lounge around in the sun or swim and snorkel in the sea, there are plenty of places to explore, as the area is not only a beautiful destination for walking, sailing and paragliding but it also rich in culture and history. We hopped on a bus to the nearby town of Fethiye, a large commercial harbour where there is an excellent market selling fruit and veg, crafts and clothes. From here you can catch boats for all-day trips out to other tiny beaches, or alternatively, if you have small children who just want to experience a short boat trip, catch the water taxi to nearby Calis beach. Solihull travel company Anatolian Sky, which is the only British tour operator dealing with Hotel Meri, offers some excellent trips from the hotel, so you don’t necessarily need to hire a car to get out and about (in fact, judging by the Turkish driving culture, it is probably safer to opt for public transport). There are options to take a river cruise at Dalyan, where sea turtles lay their eggs on the beaches at night and a place where you can enjoy an excellent mud bath. There are also boat trips on offer where you can avoid the crowds and sail to a host of picturesque remote beaches. A highlight must be a visit to Kayakoy, the eerie ghost town, which was once home to 25,000 Greeks before it was abandoned in 1923, when the entire population was repatriated to Greece following the war of independence. The town is the inspiration for Louis de Bernieres’ novel Birds Without Wings, which looks at the demise of the Ottoman Empire, the First World War and the rise of Atatürk. Anatolian Sky also offers week-long Gulet cruises, which appeared popular with a number of holidaymakers we met, offering a chance to really explore the stunning coastline. The only dilemma we had during our week-long stay was whether to relax and make the most of our immediate surrounding or to head out and explore. If you choose to do the latter, a week might not be enough to fully appreciate all that this beautiful part of Turkey has to offer. * Sarah Probert travelled to Turkey with Anatolian Sky Holidays. * The company is offering seven nights at the Hotel Meri, Olu Deniz, Turkey, from £649 per person – a saving of £229 per person. Price is based on two sharing, including bed & breakfast accommodation, return flights from Birmingham and transfers. Valid for departures on July 20, 2011 only.